Summer term has finally arrived: Welcome back to St Joseph's! We hope you had a lovely half term and spent some wonderful time with your family and friends! We began our week with some news so that we could share all our lovely adventures. In maths we are doing lots of measuring. We are measuring length and capacity. Some of us are beginning to measure using a ruler and we know that the measure is in cm. In Art we are designing our very own aliens, we are planning first and the end result will be made out of clay! In Literacy we have looked at the author Dr.Seuss... We LOVE his book 'The Cat in the Hat!'... "It is funny! It has lots of rhyme!" We have been able to discuss the differences and similarities between this book and many of his others. Our 'Sports week' was a great success. The sun came out to play which was lovely ! We had professionals come in and teach us Tennis, Golf and Rugby! This was great fun, Miss Kelly said we were great listeners and did our class proud. On the Friday was our sports day, we ran super fast and no shoes fell off ! Please look at our album for some photos of the Golf lesson we took part in! For our topic in RE - we are looking at friendship and what makes a good friend. We know that Jesus is our friend and that we can talk to him in prayer wherever. 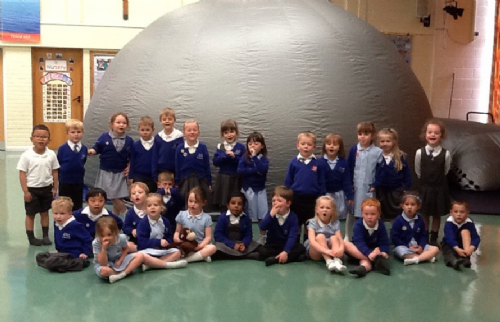 For our 'Wow Day' - we had a visit from a planetarium! We had to crawl inside a dark tunnel to get inside and we ended up in SPACE! It was beautiful! We listened to our visitors and learnt lots of fantastic things about Space. We have been writing some super Traditional Tales this term. Our stories have used suitable language such as 'Once upon a time' and 'They lived happily ever after'. We are getting very good at using Capital letters, finger spaces and full stops in our writing. In ICT we have been looking at Espresso coding and understanding how to make things move on a screen by telling the computer instructions. For our PE lessons we are getting to go outside a lot more due to the sunnier weather. We are beginning to practise our skills for the schools 'Sports Day' which we are very excited about! Our Tadpoles have finally become beautiful little Froglets! We are very proud and have enjoyed looking after and watching them grow. We now know what is important to help them grow and have looked closely at the Frog Life cycle!